NDIS is an API (application programming interface) for NICs (network interface cards). When enabled, NDIS provides always-on connection without requiring VZAccess Manager to be open. Some background processes and programs may transfer data (e.g. Windows Update) even when not actively using the computer. It is recommended to check usage for potential overages. Refer to Determining Data Usage - VZAccess Manager (Windows) for additional assistance. From the Windows desktop, navigate Start > Programs (All Programs) > VZAccess Manager. Ensure the WWAN connection status indicates Not Connected (located in the lower left). If Connected, click File > Disconnect. From the top menu, navigate: Options > Preferences. 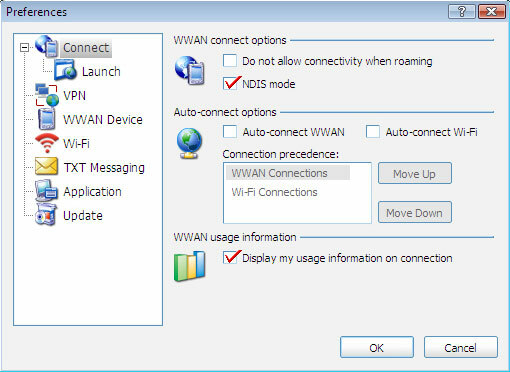 From the WWAN connect options, select (check) NDIS mode then click OK.
Click Connect WWAN (located in the lower-right corner). Once the connection is established, click File > Exit. Ensure the WWAN connection status indicates Not Connected (located in the lower-left corner). From the WWAN connect options, deselect NDIS mode then click OK.